Even though the market of cooling systems has been slowly but surely drifting towards High-End products (the current trend in the retail segment is a dramatic confirmation), budget models do not lose their popularity. Catering for a mass demand, these products form the mainstream backbone of the cooler building industry. Their development is often more dynamic than that of high-level cooling systems. The situation is clear: budget coolers prevail in out-of-the-box computers as well as in custom configurations. At the same time, boxed coolers on Intel and AMD platforms cannot satisfy the demand even on the quantitative level. Besides, boxed processors are not always preferable for technical, financial, or some other reasons. No wonder, budget coolers easily find cushy jobs in mass personal computers. But by the analogy with any other budget product category, they traditionally remain conservative — strict technical boundaries, based on the principle "take care of the pence and the pounds will take care of themselves", bring not-so-positive colors to their group portrait. The other side effect that limits the attraction of budget coolers for consumers is a small and monotonous model range, practically traditional in our parts. Fortunately, what concerns budget coolers for AMD, distributors are not asleep. They try to fight the scarcity of the market offering a more or less decent choice of budget models. A total number of budget models for Socket 754, Socket 939 and Socket AM2 offered these days on the market reaches half a hundred — it's still far from the variety of the age of AMD Socket A and Intel Socket 478, but it's enough to form the critical mass that requires from us a complex approach to reviewing such products. 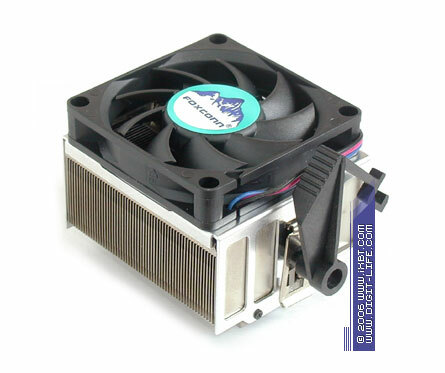 So it seems like a good time to get our test procedure for consumer cooling systems, brush the dust off it, update and use it to review modern budget coolers for Athlon 64. But first of all, let's examine the new models — one cooler from Arctic Cooling, one cooler from Cooler Master, and three models from GlacialTech. Let's also examine several old coolers that didn't make it to our reviews (7 models from Foxconn, Speeze, and Thermaltake). Let's get down to it! The first cooler we're going to examine is a budget Alpine model from Arctic Cooling — Alpine 64. 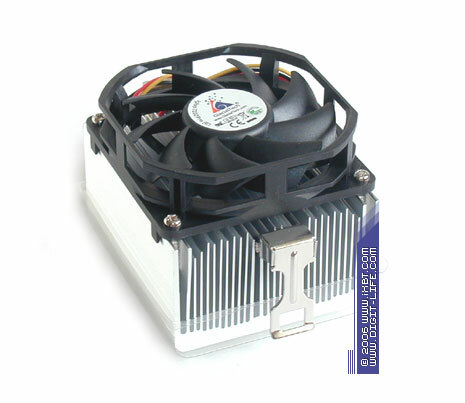 The cooler is based on a large aluminum 78x98x56mm heatsink (78x68mm base). 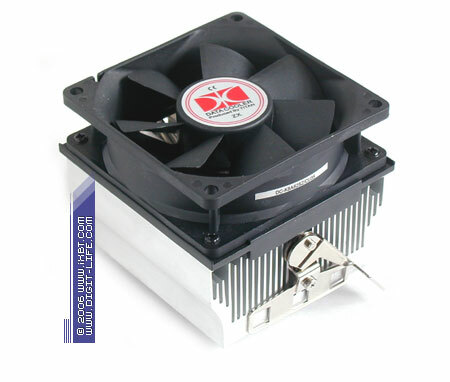 It's equipped with a proprietary "inverted" fan (92x92x30mm) with the rotational speed of 2400 rpm and a retention module adapted for Socket AM2. Probably the most important technical feature of the Alpine 64 is the way its fan is mounted: it's secured with rubber rests, which act as dampers of structural vibrations. They eliminate practically all external sounds in the cooler noise spectrum. The fan itself also produces a nice impression. It has optimized blades, an improved sleeve bearing (so-called hydrodynamic bearing), and good control circuitry. 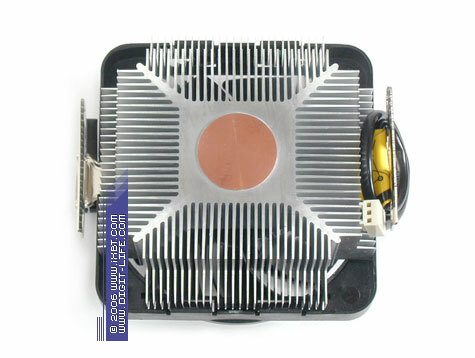 The Alpine 64 heatsink also looks good — it features sweeping fins (the average thickness of a fin is 0.7mm, inter-fin distance - 2mm, 27 fins) and can boast of developed heat exchange surface (the total surface area is about 2200 cm2). We should mention preinstalled thermal interface — highly efficient thermal compound MX-1 (composition of aluminum nitride and oxide) that offers improved thermal characteristics. 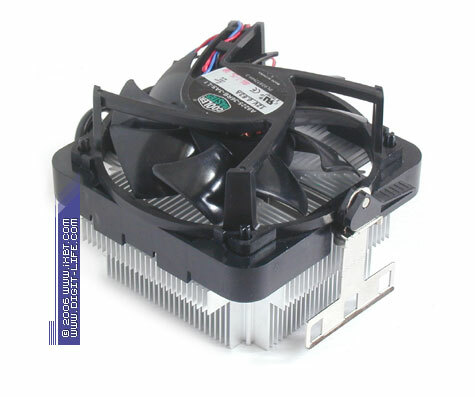 Relying on the advanced fan and heatsink, the Alpine 64 does not miss a chance to take advantage of its design and demonstrates very interesting results. The cooler combines moderate noise with good thermal characteristics and takes leading efficiency/noise positions. But the Alpine 64 does not work that brilliantly: its retention mechanism is not user-friendly and requires active manipulations with a screwdriver to install/remove the device. It spoils the overall technical image of the cooler and has a negative effect on its total rating. The Alpine 64 does not look good in our economic ratings either — that's the fault of its excessively high price. The next contender is a budget model from Cooler Master — the quiet X Dream K640. 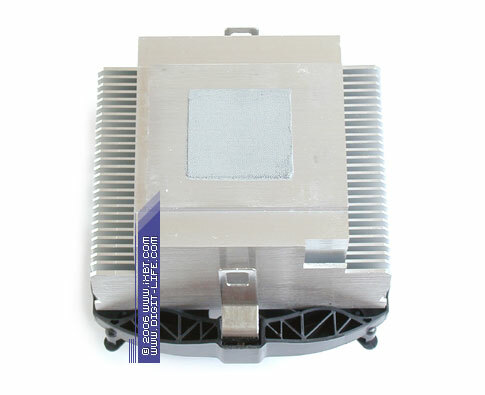 The cooler is based on an aluminum 90x90x40 mm heatsink (77x68 mm base). It's equipped with an "inverted" 92x92x25 mm fan (sleeve bearing) and spiced up with a proprietary toolless retention module. The X Dream K640 has an imposing design — the main feature of this cooler is its copper 25x20 mm core pressed into the base. The X-shaped radial finning also produces a good impression (tapered section fins, 0.7 mm thick at the base and 0.2 mm thick at the tip, the average gap between fins is 1.5 mm, the total heat exchange surface area is 1400 cm2). Another interesting feature of this contender is the thermal control system of its fan — rotational speed of the fan varies from 800 to 2800 rpm (there is a thermistor in the upper part of the finning, thermal control range: 35°C-55°C). In practice, advanced thermal features of the X Dream K640 demonstrate a decent balance between thermal efficiency and noise. A neat retention module of this cooler allows quick and easy installation. As a result, X Dream K640 outscores lots of its competitors in overall functionality and gets into the top five models in our functionality/usability rating. But the cooler does not look that good in economic ratings — like the Arctic Cooling Alpine 64, a high price lets this model down. 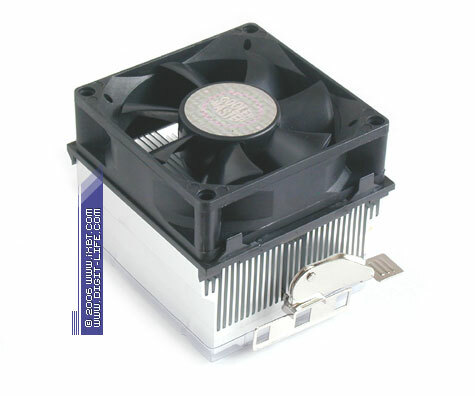 The next models are Foxconn coolers for Socket 754/939 — the "old" NBT-CMA-K8-1T and NBT-CMA-K8-2T. 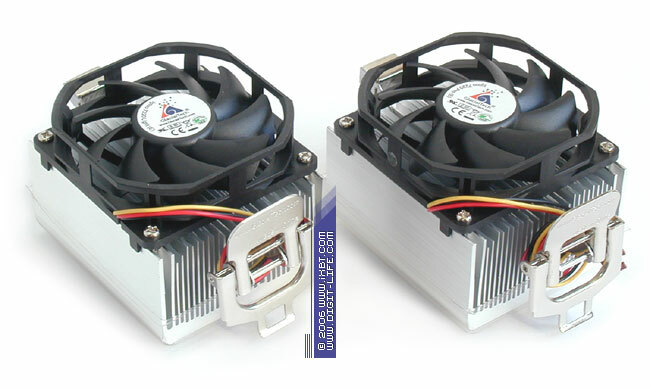 Both coolers are practically identical — they are based on an aluminum 77x80x37 mm heatsink (77x68 mm base) of the same design, equipped with a 80x80x25 mm fan (combined bearing, nominal rotational speed - 2000 rpm), and spiced up with a toolless 6-pin retention module. The only difference between them — the NBT-CMA-K8-2T has a copper 36x4 mm disc pressed into the heatsink. The NBT-CMA-K8-1T and NBT-CMA-K8-2T are not impressive in technical terms — they feature weak finning (the total heat exchange surface area hardly reaches 950 cm2), aerodynamic configuration of the fan is also far from optimal. As a result, the coolers demonstrate weak thermal efficiency (on the level of the awkward Titan TTC-K8ATB/825/SC in slow mode), sliding down to being outsiders in our tests. Even ergonomic noise characteristics do not help them demonstrate a decent efficiency/noise ratio. 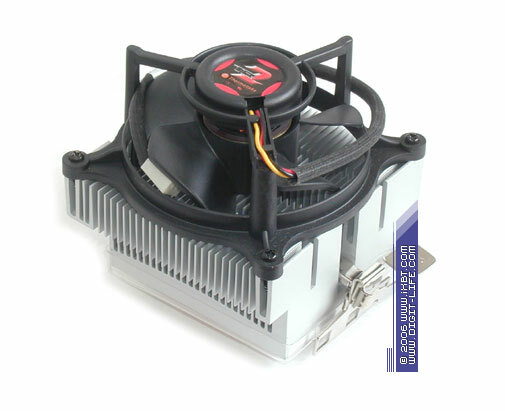 Their usability is not up to the mark either — although their retention system is quite convenient and these coolers can be installed very fast, it's actually incompatible with the new Socket AM2 because of the asymmetric mounting bracket. One of its three-pin feet is 50 mm wide and does not allow to latch the cooler in the socket. That's why the NBT-CMA-K8-1T and the NBT-CMA-K8-2T lose several other functionality points and are stuck to the bottom of our ratings. The next coolers are three new models from GlacialTech, representatives of the updated budget series Igloo 7220 — Igloo 7220 Light (E), Igloo 7220 (E) and Igloo 7220 Pro (E). 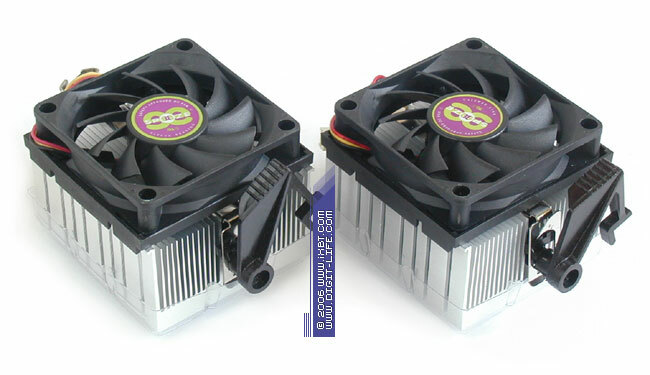 These coolers are based on the same aluminum 77x68x38 mm heatsink, they are equipped with 70x70x20 mm fans (sleeve bearing) and ranked according to their fan speed (2600, 3200, and 3800 rpm). 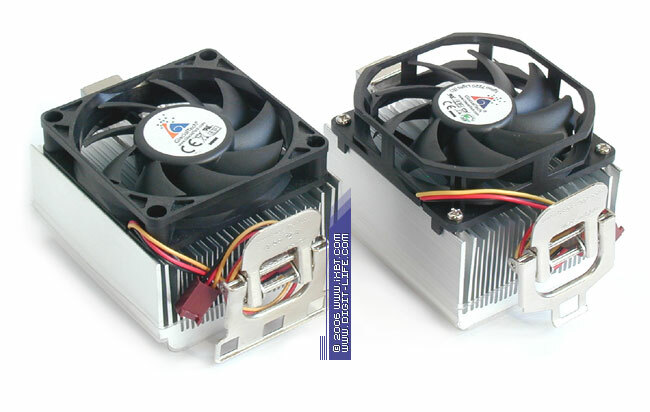 Igloo 7220 is actually an improved modification of Igloo 7210: the new products preserve the old technical trend (a compact heatsink, a small fan, a proprietary retention module), but there are some modifications to make them fully compatible with Socket AM2. Besides, these coolers should have an improved balance between thermal efficiency and noise characteristics. Igloo 7220 has a traditionally good thermal design of the heatsink with time-proven catalysts of thermal efficiency — tapered section fins and fin height alternation (these tools provide thermal and hydraulic optimization of finning). It features advanced finning parameters (fins - 0.5 mm thick at the base and 0.2 mm thick at the tip, average inter-fin space - 1.5 mm, 30 fins) and offers developed heat exchange surface area (the total area is about 1550 cm2). 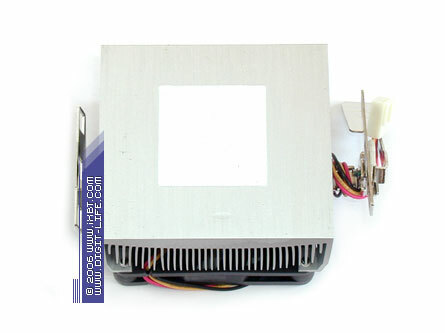 The new on-board fan has typical notches in the pipe to facilitate air intake and fight the effects of airflow recirculation at the "inlet" of the heatsink. The new Igloo 7220 coolers keep perfect order in terms of usability: the modified retention system is now compatible with a full range of AMD platforms — Socket 754/939/940 and Socket AM2. Like older Igloo 7200, Igloo 7300 and Igloo 7210, it provides easy, convenient, and fast installation. We should again pay special attention to the preinstalled thermal interface — highly efficient thermal composition of aluminum oxide and nitride with advanced thermal parameters. Igloo 7220 models also look good from the practical point of view: Igloo 7220 Light (E) and Igloo 7220 (E) repeat the success of Igloo 7210. They demonstrate a balanced combination of thermal efficiency and acoustic characteristics (Igloo 7220 (E) slightly outperforms Igloo 7210 in terms of efficiency/noise). These coolers fare well against many serious models and occupy respectable positions in our total rating. The only exception is Igloo 7220 Pro (E), it gets slightly out of the general positive trend — although it demonstrates remarkable thermal efficiency, its noise level is rather high. As a result, the top Igloo 7220 model fails to get to the top of the list. Now we should examine "old stagers" from Speeze — KestrelKing I (EE708S3-1) and KestrelKing II (EE742B3). 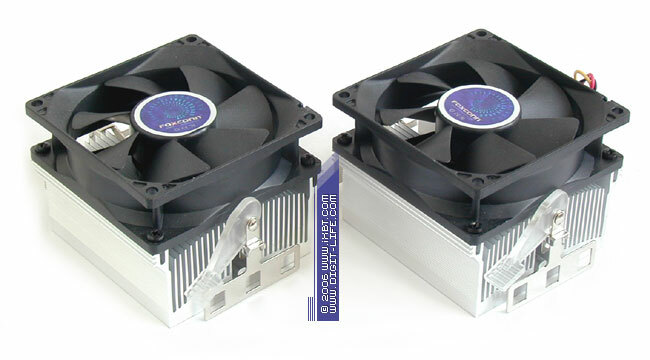 These coolers have practically identical designs — KestrelKing I and KestrelKing II are based on the same aluminum 77x68x39 mm heatsink. 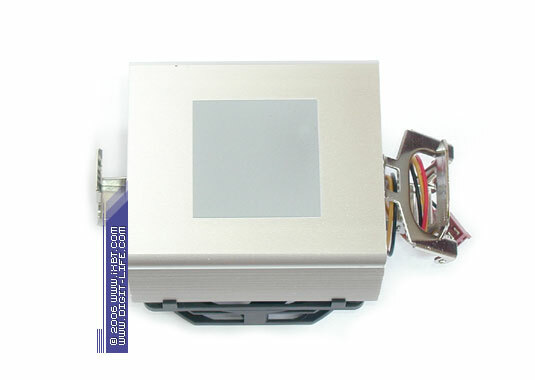 They are equipped with 70x70x15 mm fans (4200 rpm) and 2-pin retention modules of the reference design. But there are also some differences: KestrelKing II has two technical benefactors — a copper disc (30x4 mm) pressed into the base and an on-board fan with improved mechanics (ball bearing instead of sleeve bearing, like in KestrelKing I). Being equipped with purely budget components — a heatsink with mediocre heat exchange surface area (the total area is approximately 1000 cm2), KestrelKing I and KestrelKing II actually don't take a back seat — they reveal high-technology fin parameters (tapered section fins, 0.6 mm thick at the base and 0.2 mm thick at the tip, the average inter-fin gap is 1.5 mm) and claim higher thermal and hydraulic efficiency of the finning. The coolers also offer good usability — although their mounting system of the reference AMD design is less convenient than proprietary retention modules from other brands, it copes well with installation. Another technical advantage of the KestrelKings is their preinstalled thermal interface — silicone thermal paste of a good quality. At the same time, these coolers fail to prove their worth in practice — KestrelKing I and KestrelKing II offer disappointing acoustic characteristics, their noise level gets close to the critical mark of 50 dBA. As a result, these coolers are outscored by practically all contenders in the efficiency/noise parameter, they lose much in their total functionality and keep to the bottom of our overall rating. The next coolers to examine are three budget models from TR2, produced by Thermaltake — M6 SE, M17 SE, and M19 SE. TR2 M6SE is one of the old stagers in the sector of cooling systems for the AMD platform (this cooler has been present on the market for over two years already), but it still looks good. 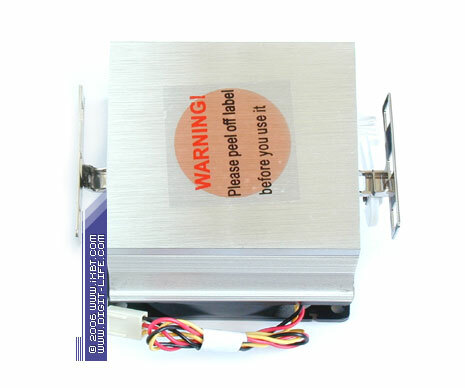 It's based on a combined copper-aluminum 77x80x39 mm heatsink (77x68 mm base), it's equipped with a 80x80x25 mm fan with the nominal fan rotational speed of 2200 rpm (sleeve bearing), and it's bundled with a 6-pin toolless mounting system. A special feature of the M6 SE is its large 70x60x3 mm copper plate screwed to the base. 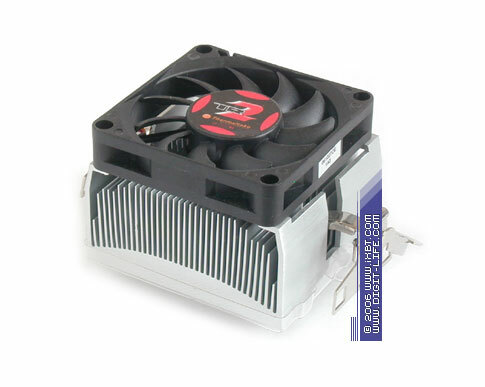 Thermaltake engineers intended it to improve redistribution of a heat flow in the CPU-cooler section. The heatsink looks good. Its finning has decent parameters (tapered section fins, 0.8 mm thick at the base and 0.3 mm thick at the tip, average inter-fin space - 2 mm, total heat exchange surface area is about 1200 cm2). We should note a very convenient proprietary retention module, which makes the cooler compatible with Socket 754/939 as well as with new Socket AM2. But despite its advanced technologies, the M6 SE does not cope with its tasks well: in practice, like in the older TR2 M3, its copper disc interferes rather than contributes to the thermal situation — the cooler demonstrates weak thermal efficiency. As a result, it has a negative effect on its overall functionality and its position in our today's ratings. 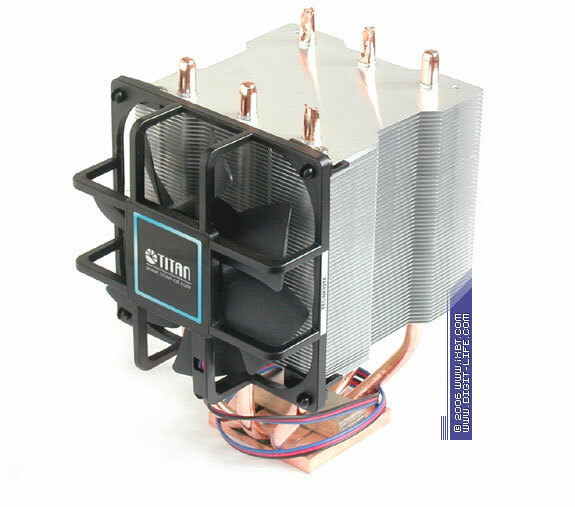 Another TR2 budget model, the "new" M17 SE, is an advanced product: the cooler is based on a large 88x87x43 mm heatsink (78x68 mm base), it's equipped with an "inverted" 92x92x38 mm fan, nominal rotational speed of 2200 rpm (sleeve bearing) and spiced up with a proprietary toolless retention module. The main thermal benefactor of the M17 SE is a solid copper disc (50x8 mm) pressed into the base. It should be mentioned that compression is done well, on a proper technological level, so the old problems (for example, in notorious Volcano coolers) are out of the question here. 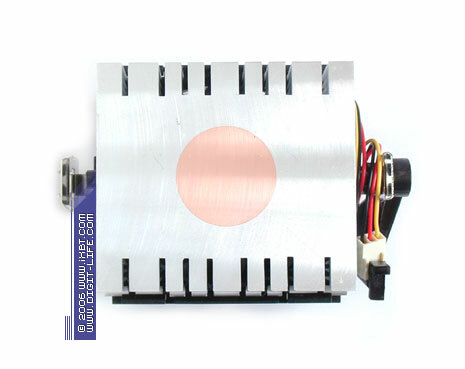 The heatsink is also rather good — it comprises sweeping fins with nice parameters (0.7 mm fins at 2 mm steps, the total heat exchange surface area is 1400 cm2). 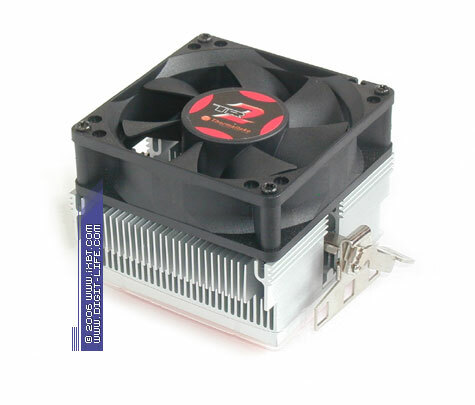 Design of the M17 SE is also supplemented by an optimized configuration of the fan, which amplifies the air flow through the heatsink without deteriorating noise characteristics. All these features definitely give high chances for success in practice. Indeed, the cooler did not disappoint us — the M17 SE demonstrates good thermal results and ergonomic noise characteristics, reaching an attractive efficiency/noise ratio. Although it does not catch up with our leaders in total functionality, it still occupies respectable positions in our ratings. What concerns another new model from the TR2 series, the M19 SE, it cannot boast of anything special, though it's a top model in this series: the cooler is based on a simple aluminum 76x68x38 mm heatsink, it's equipped with a 70x70x15 mm 3600 rpm fan (sleeve bearing) and spiced up with a proprietary toolless mounting system. 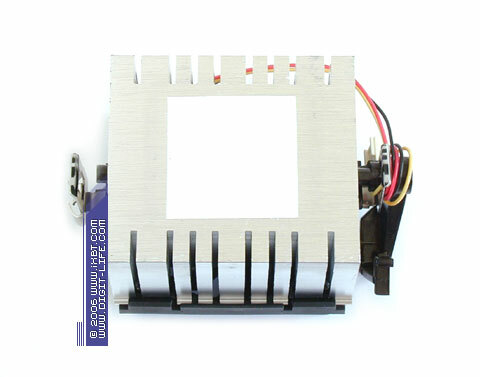 In thermal terms, the M19 SE looks rather dull — the cooler has a tight, badly ventilated heatsink with a small heat exchange surface area (the total area is about 850 cm2). As a result, it fails to demonstrate interesting results of thermal efficiency, despite its decent finning (tapered section fins, 0.7 mm thick at the base and 0.2 mm at the tip). 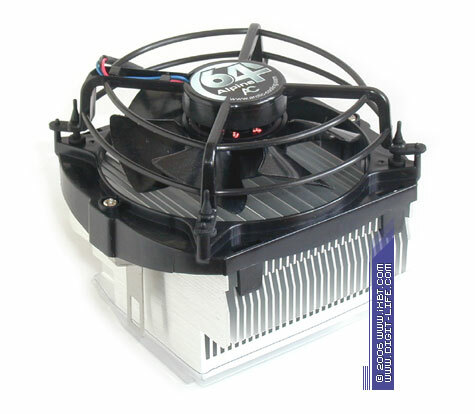 Add a noisy fan, and you'll understand why this cooler occupies a low position in our overall rating. 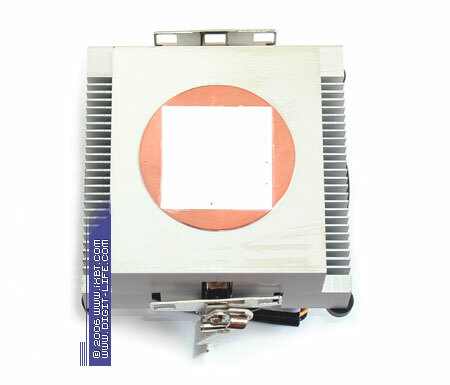 Our examination is concluded by an efficient new product from Titan — the TTC-NK32TZ. In fact, this cooler is hardly a budget model according to the combination of its external technical properties — it actually belongs to a higher class of devices. But thanks to Titan's aggressive pricing policy, the TTC-NK32TZ fits well into the limit of $17-$18. So it came to our focus here. 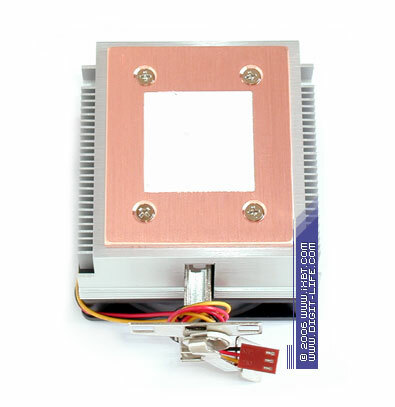 The TTC-NK32TZ really stands out against the budget background with its truly advanced design — the cooler features a high-tech heatsink, formed by a combination of a copper 48x45x5 mm core, three 6 mm heat pipes, and a block of aluminum 86x80 mm fins (0.3 mm thick, 55 pieces). That is we actually get a copy of Thermaltake Silent Tower here with the same dimensions (86x80x144 mm), similar fan (92x92x25 mm), but smaller heat exchange surface area (about 6800 cm2). So we can hope to get similar results from the TTC-NK32TZ. However, it will be too naive to think that Titan works for charitable causes here. As the ideological heir to Silent Tower, the TTC-NK32TZ, is much cheaper (than its much more expensive "forefather"), we can safely assume that its functional side is worse. So it is in practice. First of all, engineers sacrificed the fan — the TTC-NK32TZ is equipped with a technically weak fan - it has a simplified configuration of blades and weak electromechanics. There is another illustrative point — the heatsink itself is of low quality: fins are attached to heat pipes "dry", they are not pressed well, soldering between the heatsink and the heat pipes is careless and leaves much to be desired. There is another technical aspect — the TTC-NK32TZ does not have an external housing, which would have been more than appropriate here for thermal and usability reasons. So, the main contenders of our shootout have been examined. Let's proceed to test results! 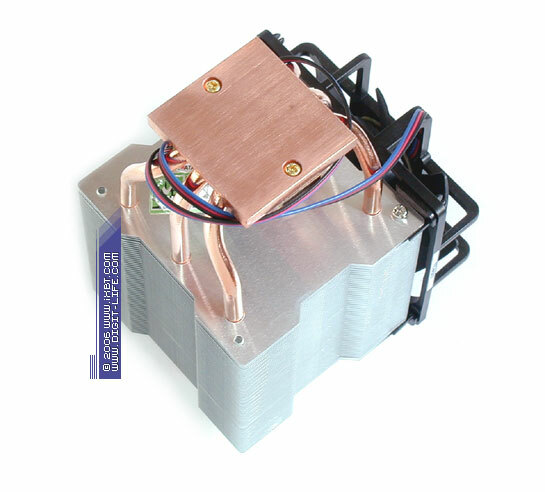 Titan Data Cooler DC-K8A825Z/CU35 copies lots of features of the DC-K8A825Z, but it has a copper 35x4 mm disc pressed into the base.